When Yankee great Joe DiMaggio died, my Dad was so sad. When I asked why, he replied, “A big part of my childhood just died.” Today, I finally get it. Yogi was my childhood hero, along with John Glenn. They were heroes at a time when that word meant integrity, courage and mastery of the game, whatever game they played. 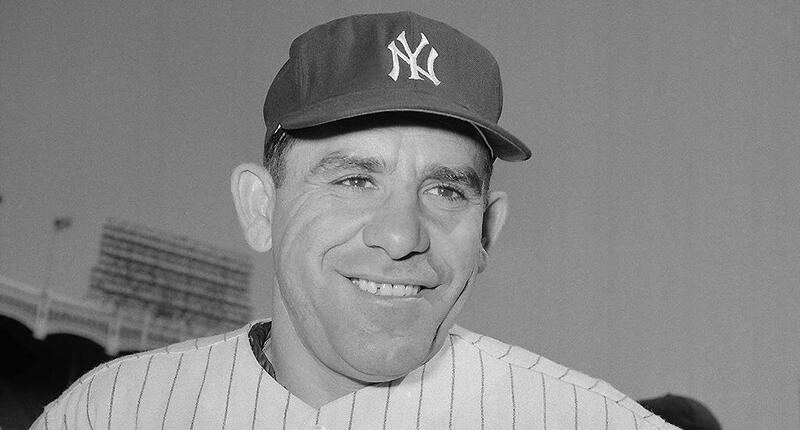 Yogi was how my Dad and I bonded over The Yankees…you see, my Dad was a catcher, one of the best and a great baseball/softball coach to me. Die hard fans never forgave Mr. Steinbrenner when Yogi was banished but we all followed Yogi’s lead, straight into the stadium when he forgave the man and celebrated Yogi Day in 1999. It was as if God smiled down on The Bronx that summer day and blessed us all with David Cone’s perfect game…who knew that when Don Larsen tossed a catch to Yogi before the game started that we would be a part of baseball history again. A perfect game on a perfect baseball day. In my many years as a news reporter, I interviewed Presidents and rock stars, but never was I more excited then when I placed a call to Yogi in NJ and got him on the phone for a “beeper.” My day, my career was made…and the first call I made after hanging up was to my Dad. Rest in peace Mr. Berra. Have a catch with my Dad when you see him! Authors, beware of Amazon’s Copyright Grab! My publisher recently received a notice from Amazon suggesting the idea of giving away copies of my two books, Amalfi Blue and Shrouded in Pompei. Amazon’s angle was to increase sales and allow me to promote my books across social media platforms. No purchase was necessary by the entrant and it’s not really clear who was paying for the cost of the prizes. Certainly, I was not going to receive money if nothing was being sold. OK, the free giveaway sounds good so far, right? Wrong. If it sounds too good to be true, it generally is! Lucky for me, I happen to be a really good lawyer and cherish my creative copyrights because the red siren of doom sounded as soon as I read the fine print in Amazon’s Giveaway Services Agreement. Royalty free – that means they don’t have to pay you to use your creative material or content. Create derivative works – that means they can make a movie or merchandise your characters when the book is a bestseller…again without paying you any royalties. It amazes me how Amazon continually tries to exploit independent authors who have become the lifeblood of their Kindle revenue stream. Writers, always, always read the fine print of any Terms & Conditions before signing up for anything that sounds just too good to be true. You risk giving away your intellectual property rights for a free book giveaway! I’ve previously discussed what to do with your Italian inheritance but let’s look at cross border estate planning when you are now the individual who owns property or a bank account in Italy. What do you do when it comes to drafting your will and making sure your heirs get their assets, both in the United States and Italy, as easily and quickly as possible? In my years of international practice between the United States and Italy, there is one thing I have learned…Italy does not like the way we draft documents in the US. Despite international treaties which afford apostilled, US-drafted documents recognition in Italy, they do things a bit differently across the Atlantic. It is essential to work with an estate attorney who can assist you with drafting a will that can be used in both countries. Key clauses would allow a will which is drafted and probated in New York, for example, to also be used in the succession process in Italy. Working with a foreign legal consultant from Italy, we can include the exact phrases necessary to pass muster with Italian law; collate the requisite supporting documentation and obtain the apostilles to initiate probate in New York and succession in Italy with little fuss for most estates. Believe it or not, as fussy as they are with their documents in Italy, it is not necessary for an attorney to undertake succession (probate) in Italy. That fosters an environment of many individuals and online companies offering to undertake succession with very little knowledge or experience in international law. It is much better to plan your estate carefully in the United States, with attorneys well-versed in the process in Italy and in the U.S., with the goal of also making the estate process much easier for your heirs in Italy.